One of my co-workers from ATC Associates brought back a sample of stucco/lathe that had fallen down from an understairs closet in a historic building in central Phoenix, Arizona. I was supposed to take a sample of the lovely salmon-colored paint *sarcasm alert* for lead paint analysis, and then split the paint/surfacing/plaster into three samples for asbestos analysis. I wanted to take a picture of it because it was the weirdest sample I have seen yet. The stringy things stretching out of the sample are most likely horsehair or goat hair. A cursory Wikipedia search for "horsehair plaster" explained to me that horsehair has been commonly used in plaster until about 1950. 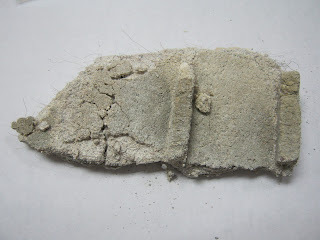 I will say that the sample smelled weird, felt weird, and was extra crumbly (in asbestos language, we refer to things that can be crushed with moderate hand pressure as FRIABLE materials). The sample came back with no asbestos detected (yay) but it did have Lead-Containing Paint (LCP). LCP is paint that contains lead less than 0.5% by weight (500 parts per million) or 1.0 milligram per square centimeter. The issue with LCP is that the United States Environmental Protection Agency (USEPA) and Housing and Urban Development (HUD) industry standard practices do not technically apply. The only guidance that the Client needed to use for the restoration project in the understairs closet was the Occupational Safety and Health Administration (OSHA) standards for lead in construction. But I still say it was a weird sample. ?